The Cape Neddick Nightstand gives a classic mission style look that deserves simplicity. A light colored oil finish with a clear wax coat over Ash is used in this picture. Other finishes and stains can be applied to meet your particular needs. 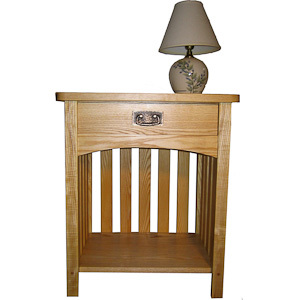 Its sturdy legs and straight lines provide the classic craftsman style look for your bedroom. The Cape Neddick is shown with a classic style hammered copper pull (optional)960.